You always carry the next ‘big ride’ with you, in your metaphorical back pocket, one to tick off in the future when circumstances allow. I had three months leave from work beginning the 1st of May and resolved to spend the bulk of this time ‘travelling north’, Bicycle touring alone and unsupported from my home in Footscray (Melbourne) to Darwin. My 8 year old ‘Iron Horse – Marauder” MTB doubles as my touring bike, with a BOB Trailer attached, the bike has lots of blazed on bits for racks and panniers, while the ‘A’ frame geometry and Shimano Deore running gear has proved faultless on several past adventures in Victoria, South Australia and Tasmania. Prior to leaving I had ramped up my cycling, taking every opportunity to get some extra ‘miles in the legs’, in between painting the house and making all kinds of outlandish promises to the family in a thinly disguised attempt to justify my extended absence, thankfully they are very supportive of my cycling lifestyle. I also took the bike into Abbotsford Cycles for a comprehensive service. The Moore brothers did an excellent job, a new front derailleur with velocity rims, cables, chain, chainrings, and Geax evolution tyres, along with an aged sprung brooks saddle, my bit of ‘bling’. I mapped out a tentative route, up through North Western Victoria, along the South Australian border; follow the Riverland to Port Augusta, then straight up the Stuart Highway to Alice Springs and Darwin. It sounded simple enough, with rest days; I expected the ride to take six weeks. The longest day would be roughly 155kms and the shortest about 60kms with a daily average of 108kms, for a total distance of approximately 4000kms. I decided to complete the section from Port Augusta to Darwin as Audax Raid Pitjantijara (2735kms), thinking this would add some structure and context. My Brevet card had 10 checkpoints and the route notes had a single instruction- “Head North”. I arrived in Horsham early, passing through the scenic Grampians, Mt Difficult and the Wonderland Range, taking a road less travelled to Roses Gap I was rewarded with a flock of yellow tailed black cockatoos. When the conditions are good I’m travelling at about 15 km’s an hour but there’s just enough rain to be annoying as the wind springs up I’m reduced to about 10kms per hour. At Nhill I place a plastic poncho over the tent to stop from getting wet. It’s difficult because the nights are freezing while the condensation wets everything. The countryside changed form the thick bush of the Grampians to flat grazing and cereal country in the Wimmera. Bob, bike and I w ere all coping well. It’s Wednesday in Bordertown – I thought it was Tuesday. I’m starting to lose track of time. My new life had a different rhythm, up early break camp; ride then make camp, explore little country towns, no radio, newspapers or TV- bliss. There’s so much to see on the road: Snakes, kangaroos, birdlife and strangely banana skins! At first I put this down to other cyclists, bananas being a preferred food of bike riders, however, closer to the SA border I see more and more banana skins, It would seem people were scoffing them down prior to the quarantine bin. In SA you’re unable to bring a loaded banana into the state! I was excited and a little nervous about camping alone in the wilderness, out here any fears or doubts you have pushed to the back of your mind come to visit especially at night, it was cold and beautiful under a cloudless full moon in the Ngarkat /Scorpion Springs Conservation Park. It took me 2 days to travel the 155kms from Bordertown to Pinnaroo , a journey that you could do in a car in less than 2 hours. I move at a slower pace where times measured in days rather than hours. I noticed far more as I made my way further north. It was getting warmer and the country smelled different. The birds sing, I ring my bell and sing back – it’s harmless enough; simple and different. 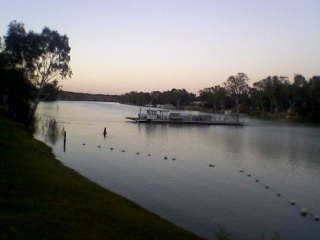 Camping among the kangaroos on the banks of the Murray at Loxton was delightful next day I push on past Waikerie, Ramco, and Moorook, crossing the river by punt at Morgan. After a ‘Dingo’s breakfast’ (A piss and a look about), it’s a fun day on the bike amid the low salt bush, a foggy start is short-lived as it fines up into a crisp, clear morning: Ideal cycling weather. I get full use out of my ‘triple’ in the ‘granny’ up a couple of sharp hills then running out of gears on the big chain ring for a delightful 20 km stretch into Spaulding. The days roll together, Burra, Crystalbrook, Port Germein and then Port Augusta It feels like I belong out here, living the dream, the bike and I ease through the environment. Physics tells me you have to ride harder to push through the wind, so I just change down a gear and work with what I’ve got in this open, hilly country where the wind plays tricks, sweeping you along one minute and pushing you back the next. The Stuart Highway snakes across an ancient foreign land; the road itself is the modern world. I keep as far to the left as possible, getting off completely for the road trains , I move back in time , saltbush and an occasional stunted tree can be seen pushing up through the rust red soil, which is peppered with bleached white bones of unknown animals. As Spock said to Captain Kirk: “Its life Captain…but not as we know it” vastness and loneliness envelope me, it’s not often in life you’re confronted with isolation and space on such a scale: No phone reception, no plan B and no way back! This is what self supported touring is all about. At most times over the next few days the highest point on the horizon is me which becomes an issue when desert storms roll in. No cover, fearful of lightning, I’m shivering cold lashed by a biting wind. I rode on as there is no alternative, later it got hot, real hot. I dried out while the wind and heat whistled off those rocky plains making it hard to think, refilling my bidden, in the silence, I could hear the rocks moving ,rolling together. 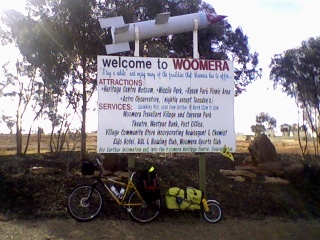 Glendambo, Coober Pedy, Cadney Park and Marla: Once just mythical names on a map become welcome rest stops. At the Coober Pedy Post Office I collect a package from home. At times the wind is hot, strong and in my face after 4 hours riding I’m only 35kms out of Marla and exhausted! I think about chucking it in, hitchhiking, anything to get out of the wind. After a mini break (down) I resolve to push on and do 100kms today, that way if the wind is worse tomorrow I have at least covered half the journey to my next rest stop. I try to imagine the wind blowing with me not against me. Shakespeare said: “Things are neither good nor bad only thinking makes them so”, or words to that effect. I ride on in a manic determined kind of way, by 5.30 having done 95kms I had to look for a campsite: I found a place, pulled off the road, a well worn routine by now: Ride, camp, sleep then ride again. The wind moves round to the South East and its great riding. I’m chased most of the morning by a storm cloud that eventually caught me about 11.30am and dumps a tidy sky full over me, washing off some of the red dust. I yell at the sky: “Send it on down Huey!” which he does in spades. Dried out and stained red, I rolled into Kulgera Roadhouse about 3pm after crossing the border into the Northern Territory from South Australia only 280 kms to Alice Springs. I enjoy the landscape of NT, its open country with better roads and granite outcrops. They are called the ‘weeping rocks’ which hold the rain water in cracks and crevices for days before leaching it out to give the appearance of crying. Passing through Erldunda, where the road was being resurfaced I picked up a fresh coat of tar and stones that stuck to my tyres. The trusty Swiss army knife comes to the rescue. I dug out most of the stuff however a lot has dried. Stuart Wells is the last stop before Alice where I was greeted by Dinky the singing Dingo, that is a Dingo which runs over the keys of an old piano and sings. I thought it sounded like a mix of pain and barking but what do I know? 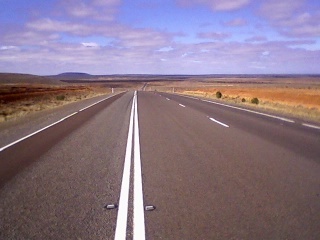 The ride continues on in benign conditions through range country at the foot of the MacDonnell Ranges. Suddenly I’m getting close; a prison on the outskirts of town is always a good indicator, my wife Therese and daughter Grace have flown in to visit and before I know it I’m here in Alice Springs. I had my Audax brevet signed at the caravan park. I was 2,500kms from Footscray and had 1,500 to go to Darwin, so I was over half way and looking forward to a couple of rest days with the family. We drove in our rented Britz Van to Yulara the resort at Uluru (Ayers Rock). We saw the rock in its entire splendor. Grace was sick with a stomach upset and deteriorated on Friday night so on Saturday morning we called in at the clinic to have her checked out. The paramedic suspected acute appendicitis and called in the Royal Flying Doctor Service. This was not part of the plan! The flight: was scary, Grace was doped up on morphine and we shared the plane with a nurse, a heavily pregnant woman and her mother. It was tight and cramped and the light aircraft was thrown around in the torrential rainy thunderstorm. There was some concern that we wouldn’t be able to land at Alice Springs. During the 35 minute flight, the pregnant woman’s waters broke; the paramedic had to attend to her over me. I averted my eyes and focused on my drug addled daughter. The turbulence got worse the cockpit was open and all sorts of alarms were sounding, the pregnant woman was moaning, Grace was crying and I thought we were all going to die. After 4 days Grace was out of hospital, a little washed out, but recovered from a server case of gastroenteritis. I say goodbye to the family and decide to keep going riding on to Darwin. About 40 kms north of Alice Springs I cross the Tropic of Capricorn. A slight wind at my back made the going easy. The landscape changes, termite mounds appear, small at first then larger and more frequent, there’s been a lot of rain recently, too much even for this parched landscape to soak up, flat sheets of still water cover the ground, seeming like the fabled “Inland sea”. Wildlife was everywhere, birds are in profusion: Budgies, finches, spinifex pigeons, assorted parrots and of course eagles, which seem as common around the range country as seagulls are at home. While I’m on a big bike ride, each day is a ride within itself, a stage if you like, with its own rhythm challenges and opportunities: Flat stages, hills, wind, rain, sun and other unforeseen hazards e.g. Road Trains, wild cattle… I would break down an average day of 100kms into 4 stages with small breaks, this worked well. Feeling strong and with the bike performing well, I power along through magnificent country in excellent conditions making good time and reveling in the experience. The next week was full of great days with long distances covered in near perfect cycling conditions. It was a long 138 kms run to Renner Springs, on top of the previous day’s 135 kms. 270 kms over 2 days is a tough Audax weekend on the road bike! It was a further 150km to Daly Waters where I camped among familiar faces, “Grey Nomads” who I first met 3 weeks back in Coober Pedy along with others that I saw along the track. At Mataranka I made camp at the Thermal Pools Resort where the ground is rock hard and it was becoming increasingly difficult to set up the tent. I cobbled together a swag-type situation incorporating the bike and BOB as part of the frame. It only needed to hold together for 3 or 4 more nights. The thermal pool was beautiful, but I just didn’t like being there by myself. It was all couples- Blokes in budgie smugglers or lolly-bags and women in sarongs or oversized towels. People would chat to me and I was happy for the conversation: “We saw you on the road” they say or “How far do you travel each day?” I did my best to make people understand that apart from our bicycle fetish, cyclists are just like everybody else, but end up sounding like a pervert trying to explain away their nasty little habit. Oh well! I push on in the now tropical conditions towards Katherine, encountering the usual cross winds. The last 8kms into Katherine was on a separate bicycle path, which was nifty. I pulled into a caravan park by the Katherine River, had my ‘Brevet” signed, the last Audax checkpoint until Darwin, unless there is a secret control at Pine Creek I thought! After a balmy 100kms from Materanka to Pine Creek, I relax in the afternoon sun as the realisation that the ride I have been on these last 6 weeks was nearing its completion. The next morning I was feeling cherry ripe and strong on the bike. I suppose I had ridden myself into condition. Its 112 clicks to Adelaide River and rather than push hard I resolved to ride within myself and enjoy the penultimate day of my ride. At Adelaide River I stripped the panniers and the rear rack from the bike. I repacked BOB and discarded anything that was originally white and was now stained red from the desert dust. I was set for the run into Darwin and the last day of my ride. While I was distracted thinking about the next adventure and this one coming to an end the City of Darwin was sneaking up on me. Darwin is well laid out and you really start to hit the outskirts some 30kms from the city, lots of caravan parks and gun shops, or so it seems. When I get about 15 kms out of Darwin at Howard Springs, I see a bike path that runs along side the highway into town, so naturally I take the path and roll right along, past the RAAF base. I turn right up Bogat Road to ‘Bike Fit” a bike shop where I had pre-arranged to box my bike for the flight back home and have my Audax Brevet signed for the last time. I spend the rest of the afternoon cruising around Darwin City and the beach.